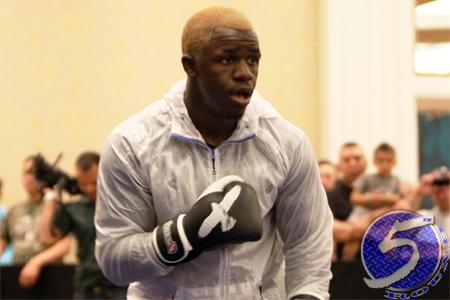 A critical lightweight affair between Melvin Guillard (Pictured) and Fabricio Camoes has been added to the “UFC 148: Cruz vs. Faber III” roster. Not too many moons ago, Guillard was in contention for a title shot. He now could be facing a must-win predicament after having lost two consecutive fights. “The Young Assassin” has dropped his last pair of scraps in the same rear-naked choke fashion. Given Guillard’s deficiencies on the ground, the UFC didn’t do the slugger any favors by assigning him a third-degree Brazilian jiu jitsu black belt. Camoes, on the other hand, is perfect through his past three contests. The 33-year-old posted a submission win over Tom Hayden in his big league debut in January. MGM Grand Garden Arena, Las Vegas, Nevada will host the July 7th festivities. Bantamweight champ Dominick Cruz will headline the show opposite Urijah Faber.